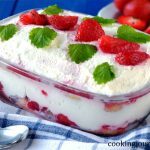 This beautiful no bake Greek yogurt dessert is a perfect summer treat! Surprise your family with mini chocolate yogurt cakes. 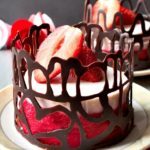 These are elegant desserts, decorated with chocolate and strawberries. 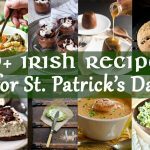 One of no bake recipes that you need to try for sure. This desserts is like a healthier cheesecake, as there is Greek yogurt used instead of cream cheese. The combination with chocolate and fresh strawberries will make you happy, I promise! 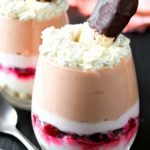 You can make this no bake Greek yogurt dessert for one to eat for 3 days! This is the recipe for 3 small yogurt cakes, but you can easily divide the amount by 3 and enjoy it alone, why not? Moreover, these desserts can last in the fridge for up to 4 days. If you wonder why we need three yogurt dessert for the two of us… Well, I love to have something in the fridge for the next day too. The first one, who gets up earlier will have it for breakfast! However, we usually divide the last one in half for two of us. Moreover, no bake Greek yogurt dessert is best enjoyed outside. 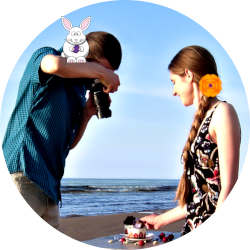 Make it more romantic and drive to the sea or by the river on the sunset! This is also a great idea to have a pleasant pastime for the Father’s day. Greek yogurt is sweetened with white chocolate. 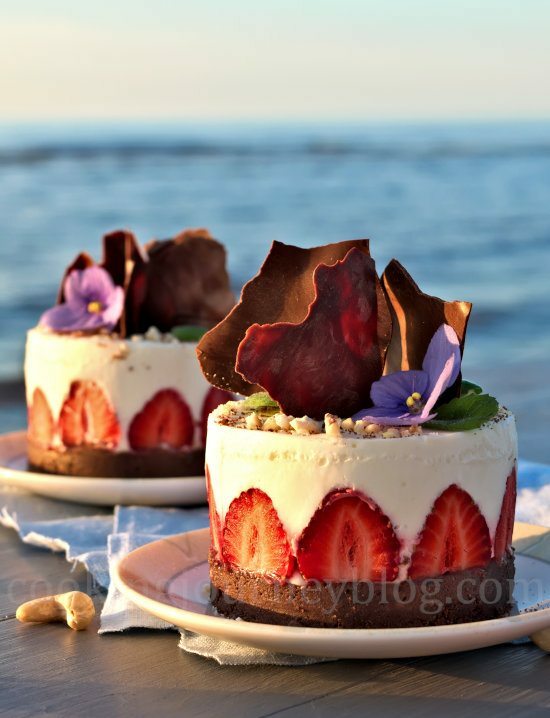 Fresh strawberries make a great decoration and give a brisk taste to the dessert! I didn’t add any sugar to this No Bake Greek Yogurt Dessert, but you can whip the heavy cream with a tea spoon of sugar, if you need a sweet tooth. However, it’s better to mix in a tea spoon of honey in the end. But white chocolate give the sweetness, strawberries are sweet too, and the Oreo base is pretty sweet too. However Greek yogurt dessert with honey and strawberries, sound pretty delicious! If you want a quick similar breakfast, but without gelatin, check our Strawberry appetizers. The dark layer consists of crushed chocolate biscuits, chocolate with Oreo filling and a little bit of melted butter to “glue” together. If you want a healthier base you can check our Vegan Avocado cake for the ideas. However, all these flavors – Oreo chocolate with yogurt and strawberries go very well together! If you can’t find Oreo chocolate candy or Black&White, you can substitute to milk chocolate strawberry, raspberry or even mint filling, for example. 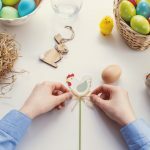 Decorating desserts is a fun part that you can get creative with! To make chocolate figures, melt the chocolate, then spread in on the pan, layered with parchment paper for easier clean up. 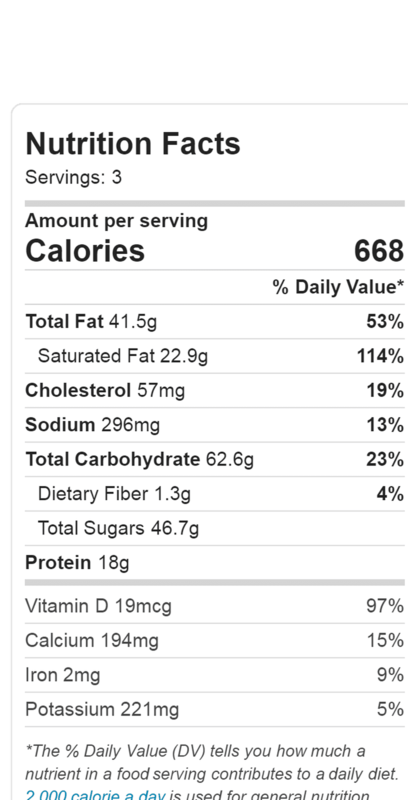 When it’s set just cut the figures you like and insert into yogurt desserts. A also added some crushed cashews, but you can crush other nuts, too. Add some flowers and mint leaves! Also I added a violet flower (pansies) to each yogurt dessert, which is optional, but gives a beautiful look, doesn’t it? I actually grow 2 of them on my windowsill. It is easy to care and doesn’t need much watering. There so many colors of these flowers available for growing indoor or outdoor. You can add other flowers that you have! 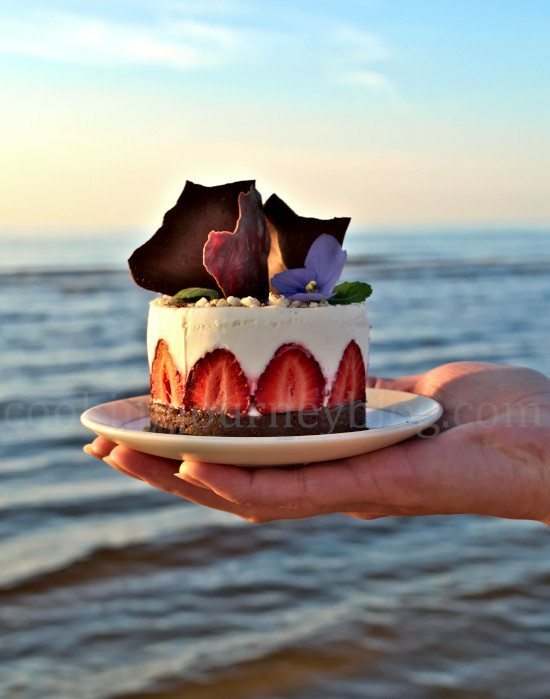 It’s summertime, yeah, a beautiful time to showcase nature beauty in your desserts. If you ask me – no, I don’t eat the flowers. But pansies are edible flowers. And it’s better to eat the flower that you know where they come from, basically organic, non sprayed. Best to grow yourself! However not all flowers are edible! Make a research beforehand! 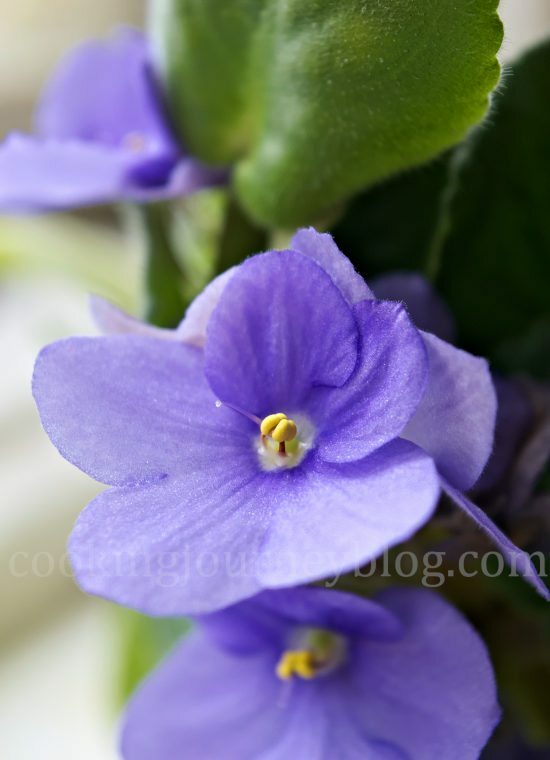 Moreover, you can use these flowers not only in desserts, but also in salads and drinks! I know you are maybe used to making cheesecakes and desserts with cream cheese. On the other hand, Greek yogurt is lighter, healthier, less fat and more protein! It is pretty thick too, so it is easier to get set in the fridge. I only added whipped cream for a smoother taste. 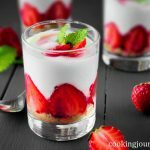 Greek yogurt is great for adding in desserts like Chocolate Blueberry cake, and these Easy strawberry desserts in glass…. and much more coming soon. 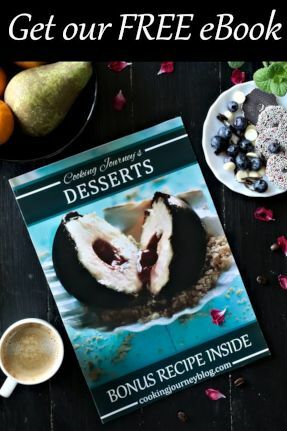 Explore our summer desserts! I used gelatin to set no bake Greek yogurt desserts, because it is more available in my local store than Agar powder. 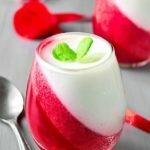 If you want to make these desserts vegetarian (you can set yogurt desserts with Agar powder), check Valentines Healthy Strawberry Desserts to get the instructions in our blog post. 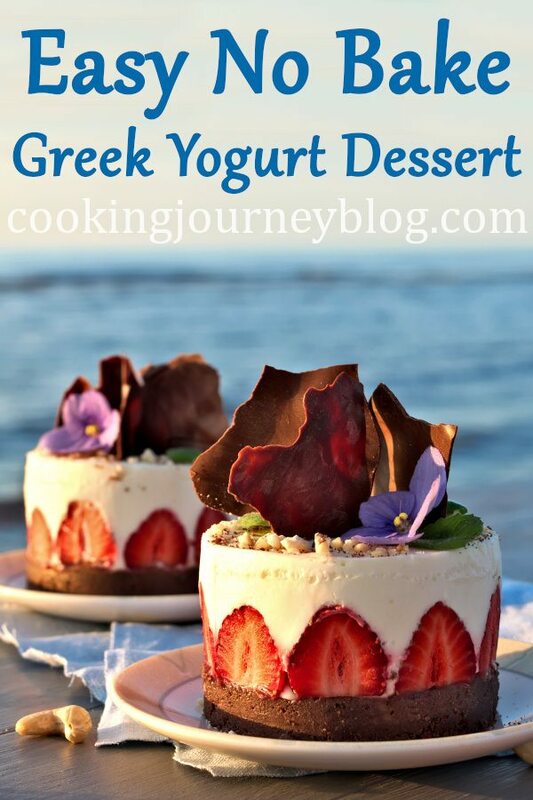 This beautiful no bake Greek yogurt dessert is a perfect summer treat! 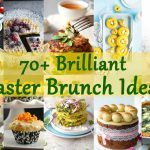 You don’t need to bake any cakes to surprise your guests and loved ones. Combine gelatin with water and leave to bloom. For the base combine chocolate biscuits with Oreo chocolate and melted butter – in the food processor. Put 3 molding rings (each 3 inch/ 7,5 cm in diameter)** on the flat plate or tray, layered with parchment paper. Divide the chocolate crumbs between all the rings. Gently press to the bottom with a back of measuring cup or a bottom of the shot glass (or any small glass). *** Leave in the fridge. Melt white chocolate on a Bain Marie or double boiler. Whip heavy cream until very soft peaks (here you can add sugar, if needed), about 5 minutes, until it reminds yogurt texture. Fold whipped cream into Greek yogurt. Slowly mix in melted white chocolate, working in batches. Melt gelatin in microwave or on the stove. Add a tablespoon of yogurt mixture in the bowl with gelatin and mix well. Combine this mixture with white layer. You can whisk on a slow for a few seconds until everything is combined. Remove rings with chocolate base from the fridge. Cut off green par of the strawberries and slice every strawberry in half lengthwise (see the photos). Arrange the strawberries around the ring. Press cut sides to the rings. You will need about 5 strawberries per ring, depending on the size of the strawberries. Pour the yogurt mixture in the rings and leave to set in the fridge for about 30-60 minutes. When you see it is set, you can also check with your finger. To remove the desserts from move, run a thin knife around the edges (don’t push it more than half the inch). Then invert the rings – upside down – with white layer on the parchment paper (cut the paper in three squares). Gently push the biscuit base with ALL your fingers, pulling the ring up - with the other hand. Then raise the parchment paper and put the dessert on the plate with biscuit side down. 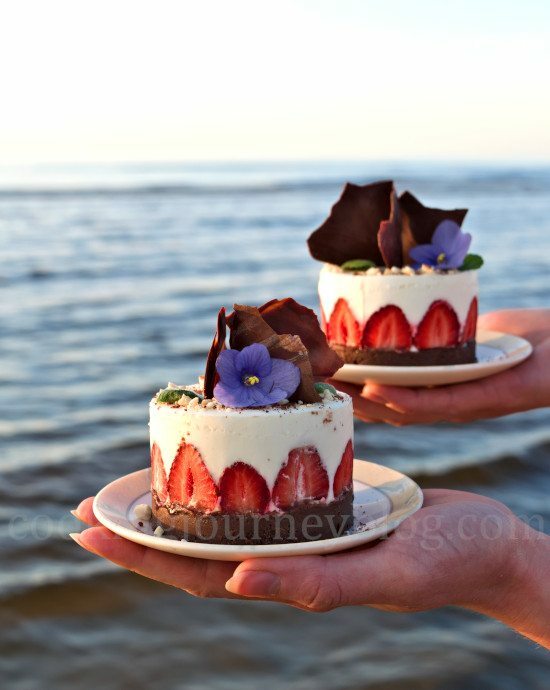 Insert chocolate figures on top, add strawberries, mint leaves and flowers. Sprinkle crushed nuts and chocolate biscuits around the edges of the dessert. 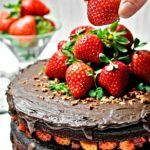 * Melt 100g dark chocolate on the Bain Marie or double boiler (more instruction on this method you can find in our Cherry Cake post). Pour over baking tray, layered with parchment paper. Spread evenly with an offset spatula or a knife in thin layer. Leave to set in the fridge. Then with a sharp knife cut figures. Leave in the fridge until needed. ** If you have 1 or 2 rings, you can work in batches. Divide all the ingredients in 1-2 bowls. Leave the butter and gelatin to add BEFORE mixing with other ingredients and placing in the ring molds. *** If you press the chocolate base too hard it will be hard like a rock, but still possible to cut with a knife. Oh my goodness, this dessert is gorgeous! 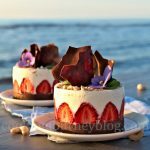 I love no bake desserts during the summer! Thank you, Jessica! Summer is a no fuss, no bake season! Such a pretty dessert and sounds so good. 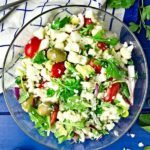 Love that it’s made with greek yogurt so you can have it without any guilt! What beautiful photos! Love this healthier version of cheesecake! Great idea to use Greek yogurt as a substitute to cream cheese. The chocolate triangles on top of these mini cakes is a pretty finishing touch too! Thank you, Marie! I love to play with the decoration of desserts, it’s such a fun and creative thing! Such a pretty dessert. And I agree, Oreos, chocolate and strawberries with yogurt are a fantastic flavor combination! Oh my gosh! These are so cute! And I can just imagine how they taste just by looking at your beautiful photos!! I can’t wait to try it! These are so delicious, believe me! 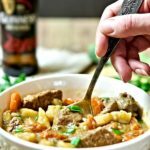 Hope you will try this recipe soon, you will be delighted.